Went back and tried to review comments and questions. I know some have been answered in depth but some others maybe not enough to make the point clear so here are some short replies and thoughts. May 15 Quampers asked about tire gauge accuracy. Quampers, I currently travel with two digital gages that are accurate to 0.5 psi when compared to ISO certified pressure gauge in a tire testing lab. I can compare readings between these two gages and as long as they are within 1.0 psi or less of each other I can be pretty confident they are still giving me the correct pressure. I will have the gages checked on a two year cycle even if I find no change in their readings. These are the gages I will use to compare to others at my Tire Basics seminars. FMCA at Madison, WI Aug 11 and at Gypsy Journal Rally at Celina, Ohio Sept 27. June 25 Tom asked about tire rotation and where to put the newer tires if you don't buy a complete set. I have heard it said by others that if you don’t have a problem with irregular wear on your RV you don’t need to do an alignment or rotate tires. I guess that may be true as long as 1. The manufacturer of the coach bothered to do an alignment at the end of the assembly line and 2. You keep a close eye on the wear of your tires. Now I can tell you that in my experience it appears that some manufacturers may be cutting corners when it comes to spending the time to set the alignment. After all your warranty is only good for a year and in that time most RV drivers will not get enough miles on their tires to see alignment problems. The second point is that even if you do complain the mfg will probably tell you it is your responsibility to ensure the coach or trailer is in align, even though there is no mention that as a new owner one of the first things you would need to do is to drive your new rig to a heavy duty alignment shop and do the work the manufacturer should have done in the first place. When it comes to the question of where to place the new tires there are a couple of things you must consider. If your RV has dual tire position you need to be sure the Outside Circumference difference on a pair of tires in dual position is ¾” or less otherwise there will be more load transfer from one tire to the other than is advisable. Not Outside Diameter buy OC which is a more accurate measurement to get if you don’t have special tools. So for Tom it will depend on how many tires he needs to replace as to where they go. When I recently rotated my tires because of miss alignment on fronts. I measured all seven tires (including spare) then put the most worn tire as the new spare. It worked out that the still new original spare ended up on the front and I was able to match my duals to within ¼” for each pair. Now if we are talking about a passenger car the two new tires should go on the rear to give you better wet traction and decrease the potential of a rotating skid and spin-out in an emergency. This is less of an issue for heavy RVs due to the weight cutting through the water better. On multi axle trailers I would put the new tires on the front as this location is less likely to suffer a puncture and if you are going to lose a tire due to puncture I would rather lose the older tire. Hope this didn't confuse too many people. As you can see there are a number of things that need to be considered. LRR spec tires are designed to trade off a number of performance characteristics to improve fuel economy. Rolling Resistance is the force it takes to roll a tire under load. The more force the more energy needed to make the vehicle go down the road. I have not heard of LRR tires in RV sizes yet as most of this work is aimed at Hybrid cars getting 40 MPG or more. What is the minimum air pressure you need to run? Simple question but there is much confusion on the answer. In the March 30 post we covered the fact that it is the air that carries the load not the tire. The April 16 post showed what can happen to tread wear if you are over-inflated or under-inflated by a significant amount. May 10, the relationship between temperature and pressure was covered. May 23, the tire certification label or “Placard” was covered. July 8, I covered the effect of elevation (altitude) on tire pressure. But after reviewing all these posts it has been pointed out that there was no clear indication on the minimum inflation you should be setting your tires at when you check before a trip or travel day. 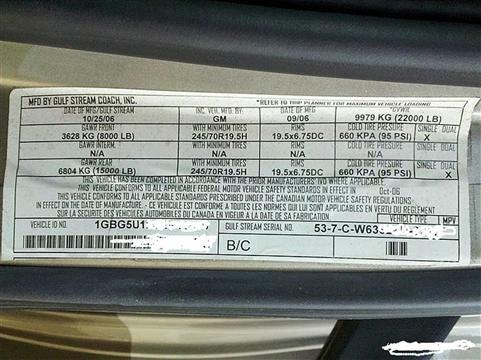 There have also been questions about the minimum level for the warning from your TPMS. I have no way of knowing every car, pick-up trailer or motorhome tire application so I can’t give you a number but I can provide step by step instructions so you can determine the values you need. 1. The tire size and Load Range. Be sure to include the letters that are part of the size. Tires on most cars will start with a “P” but some imports have no “P”. SUV and small Pick-Up may also have a “P”. Larger Pick-ups with probably start with “LT” and many Class-B or Class-C RV will also have tire size that starts with “LT”. Many trailers will have tire size start with “ST” and most Class-A RV will have no letter before the numbers. We call these TB (truck-Bus) type. 2. The Minimum inflation and maximum load molded into the tire sidewall. You will find that LT , TB and ST type tires will have numbers for both Single (front) and Dual (rear) position. Write them all down. 3. The Minimum inflation as provided on your Placard. Note you may have different minimum inflations Front vs Rear. Some Pick-up may provide a light load inflation and a heavy load inflation. Anytime you are towing you need to consider that heavy load. 4. Your actual side by side load for each axle. Here a guess may be off by 5% to as much as 20% so you need the facts. 5. Write down the minimum inflation for all tires on each axle based on your actual load for each position found in #4 above. Remember all tires on any axle should have the same inflation, so the number for the warning level from the load tables would be based on the heavier side. You can get the minimum inflation based on sacale weight from the Load & Inflation tables available from your tire manufacturer or other sources. Well over 95% of all tires of the same size have the same values as they generally follow Industry Standards, so if your tire manufacturer doesn’t have tables available on the internet find a table from another tire company and use that number. Okay, so now you have all the information needed. Your minimum cold inflation is the number shown on your Placard. This inflation has been established by your RV manufacturer as the inflation needed to carry the design load of the RV and to provide the best compromise of ride, wear and vehicle stability. 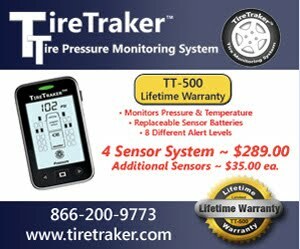 Your minimum for the warning level from your Tire Pressure Monitor System should be the higher of 80% of the minimum inflation on the Placard or the minimum inflation needed to carry your actual load based on the Load & Inflation tables. 3. The minimum inflation as provided on the placard. 4. The actual side by side load for each axle. 5. Minimum inflation for all tires on each axle based on actual load for each position found in #4 above. So we can see that based on the heavier RF we need a minimum of 85 psi to carry the load in the front axle and 90 psi in the rear based on the heavier RR. I would suggest that you set your warning levels at the 85 to 90 psi levels but you should be setting 95 psi as your minimum morning inflation before each trip and each day of travel as this is the manufacturer’s recommended minimum inflation for the vehicle. Remember if you lose 20% of your inflation it is considered to have been run flat and needs to be dismounted and have the interior inspected by a knowledgeable tire tech or engineer. 80% of 95 is 76 psi and you would like to avoid the cost and time involved in having a complete inspection so having the warning go off at 85 to 90 psi provides a nice margin. With all this information you also have learned that if you discover a tire a little below 95 psi but still over the inflation needed for the load you can plan on driving a short distance at a reduced speed to the nearest location that can provide the 95 psi needed. If you do this don’t forget to compensate for the warm tire. (See Temperature & Pressure May 10). Many suggest that you over-inflate your tires by 5 psi to provide a cushion for day to day temperature variations and I support this idea as long as you do not exceed the maximum rating for the tire or wheel. Many wheels are marked with their max inflation rating and if yours are not marked you need to contact the wheel manufacturer for the specifications. We have previously discussed tire pressure change vs temperature change. The question of tire pressure change due to altitude (elevation) has been brought up on occasion so I guess it’s time to answer that question. Quick answer: Driving from Death Valley to Denver will result in less than a 3 psi increase in tire pressure IF there are no other changes. So it isn’t a big deal. Now for the engineers and technically inclined the formula is p = 101325*(1 - 2.25577 * 10**-5 * h)**5.25588 according to info at Engineering Toolbox. With p (pressure) in Pascals and h (height above sea level) in meters. After unit conversion and if we assume 14.7 psig at sea level we theoretically would have 12.2 psig at 5,000 ft. This decrease in pressure outside the tire would translate to a 2.5 psi increase in the internal tire pressure. In reality there would be other changes that would also affect your tire pressure as I doubt that you would find the ambient temperature to be the same. If you are checking your tire inflation the morning of every travel day as you should, and adjusting when necessary to meet your minimum inflation as published on your RV tire placard, you will not have any issues as you travel across America, no matter the altitude (elevation) or weather. Post a comment to the June 25 topic "Do you have questions?"